The Oklahoma City Blue Devils were a territorial band with a legendary reputation among musicians in the Southwest. Starting in 1923 accompanying Billy King’s road show, "Moonshine," at the Aldridge Theatre in Oklahoma City, they also performed for white and African American audiences from Texas to the Dakotas until stranded in Bluefield, West Virginia. The Blue Devils were a "commonwealth" band, lacking a leader, and members voted democratically on every issue. Early bandsmen included bassist Walter Page, pianist Willie Lewis, trombonist Ermal Coleman, and drummer Edward McNeil, and through the years singer Jimmy Rushing, saxophonist Henry "Buster" Smith, cornetist Oran "Hot Lips" Page, tromboner/guitarist/composter/arranger Eddie Durham, pianist William "Count" Basie, and Lester "Pres" Young. Bandsmen often taught lesser-known musicians before they joined the band. The Blue Devils recorded only once, in 1929, cutting two records, "Blue Devil Blues" and "Squabblin’." They were a rival of the Bennie Moten band from Kansas City, but the two never competed against one another in the famous "battle of the bands" as some musicians claimed. Several Blue Devils, Durham, Rushing, Basie, and Hot Lips Page among them, joined Moten’s orchestra, making the classic 1932 recordings including "Toby" and "Lafayette," considered to be the earliest examples of big band swing. 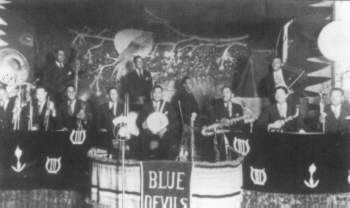 By the mid-1930s the Blue Devils stayed in Kansas City performing in small bands and variously with bandleaders Moten and Basie. Pianist Eddie Christian led a new version of the Devils in 1935, but it was short-lived. When Basie formed his Reno Club combo in that city in 1935, his motto was to "get some Blue Devils." The band was in his opinion the finest performers he ever heard. Lester Young, Walter Page, and Jimmy Rushing were stalwarts in the orchestra, and Durham wrote many of their hits with Rushing and Basie, whose orchestra went through several versions over five decades. Douglas Henry Daniels, One O'clock Jump: The Unforgettable History of the Oklahoma City Blue Devils (Boston: Beacon Press, 2005).